The Hyundai Santa Fe offers sensible accommodations for five passengers and, in typical Hyundai fashion, a high level of standard equipment. The vehicle is now in its sixth year of production; an all-new, totally redesigned 2013 Santa Fe is scheduled to hit showroom floors this fall. 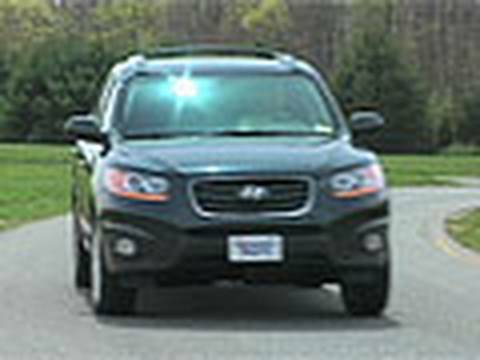 Highlights and lowlights if my 2012 Hyundai Santa Fe. I own a 2012 Hyundai Santa Fe, all wheel drive, 6 cylinder. Pretty nice ride but it is a little rough over bumps. The car is like a jack rabbit off the light, sometimes a little to fast off the mark if someone is sipping coffee. Very good front window view while driving. Extremely reliable! After seven years of ownership I never had one problem! However, I have noticed recently that the cruise control works intermittently but eventually turns on. I am not going to get it fixed. Overhead dome light is extremely dim and is in the rear. The map reading lights are also extremely dim. Steering wheel is hard to turn when car is not moving, for example; the process of backing into the garage. Towing package/hitch works really nice and I pull my two ton boat with trailer all over the place with no problems. I got the pearl white paint with the car. That Hyundai paint color unfortunately starts to pit after a couple of years. If you look closely at the paint you can see all these tiny rust colored dots underneath the paint, but you do not notice them if you more than 4-5 feet away. Headline lights work great at night, but I always turn the fog lights on too and I see everything. Stereo system is just mediocre. Every other car I get into always seems to have much better sounding speakers than my Hyundai. Not enough bass. All in all I am very happy with my Santa Fe and I am glad I bought it. Surprising room and comfort in the Hyundai Santa Fe 2012. The Hyundai Santa Fe is a very comfortable vehicle. There is a lot of trunk space, which is surprising because from the outside it does not look very big. It runs quiet. The Bluetooth connection is an added bonus making hands free driving even easier. It has a duel center console which is great for storage. The back seats recline, which my daughter loves because she gets to "relax" when we are taking long car rides. From the outside the car looks like a smaller SUV, but makes up for that appearance on the inside. Night time driving is made easier by the illumination the car provides on the inside. With this version of the Hyundai SUV, the interior is now spacious enough to accommodate a third-row seat (although it's a bit cramped and difficult to access). Still, this development, along with excellent fit and finish, makes for a more refined and versatile package. For its class, the Santa Fe also has responsive handling, which is delivered along with a firm but comfortable ride. A 2010 redesign freshened things up a bit, but didn't really push the envelope. While this iteration of the Santa Fe remains quite well rounded and competent, we wouldn't call it a world-beater.